Here’s the second mystery in our series on crimes against trucking – keep reading to discover some of the biggest culprits in holding back your business and how to stop them in their tracks. The abandoned building on South Street is the reminder of the town’s once-lusty progress, a wretched emblem of what could have been. Many people believe it should be flattened, leveled from the town’s collective memory. Give everybody the chance to pick themselves up and hurry off as though nothing had ever happened. Wasn’t that how it was supposed to go? But something did happen. And the worst thing about it was that it was completely avoidable – and that unfortunate truth made its echo continue to reverberate. Once a vibrant town, Papier bustled with activity and commerce. Businesses and families were prosperous and people seemed genuinely pleased to see others doing so well. It was one of the good places to live. But as the old saying goes, nothing good ever lasts. The once-illustrious Papier Trucking employed many of the townspeople and was one of the city’s crown jewels. Kenworths and Freightliners filled the lot and devoted drivers lined the streets, hoping for a chance to drive for the hottest new carrier climbing the CCJ Top 250. Their popularity peaked as truckers, eager to haul the ballooning amount of freight, helped grow the business at a phenomenal rate – a rate the company didn’t want to admit they couldn’t keep up with. The problem was clear: there was an exorbitant amount of paper encroaching on their space. Filing cabinets were stuffed before they were in the front door, and without the proper organization or space, unmanageable amounts of DOT- and company-required paperwork quickly began taking over people’s desks. Where moments before there was empty space, suddenly piles of pulp materialized as though birthed into existence by some unseen, omnipotent paper overlady. Rudy saw it all coming faster than a competitor’s freight train. Papier Trucking needed to kill all this paper. They needed an online application and digital onboarding forms, and then they needed a way to manage, analyze, and store all these documents. She knew the perfect solution. She stood up from her desk with a sense of accomplishment that quickly faded. Things had already grown worse. Much worse. Rudy had heard about the problems attributed with paper-based management such as compliance and security risks, antiquated processes, and physical costs. She’d heard the cutesy words ascribed to the scramble associated with a botched audit. But the phrases “paper-shuffle” and “paper-chase” couldn’t begin to describe what she saw before her eyes. The mounds of paper grew along with her anxiety as she watched the fibrous material swallow her coworkers’ desks whole. As she stared on in disbelief, the thin sheets took on a life of their own as she watched them tumble in waves across the office, devouring resources dedicated to other business functions in their path. Rudy acted fast. Dodging a flying ream of paper she could have sworn had teeth, she ducked for shelter in her supervisor’s office just as the legs of her boss, Maggie DeFranco, disappeared into a ravenous heap of paper. “Maggie!” Rudy screamed, averting her eyes from the gruesome scene. She was too late. Rudy slipped past the infestation and ran into the street, turning to see the windows of the building she once adored completely plastered in paper. The building itself bulged as though pregnant. She looked down at her ashen hands, trembling, a mess of paper cuts and blood. For Papier Trucking, a simple solution was present all along. Although our protagonist was too late, your company doesn’t have to be. 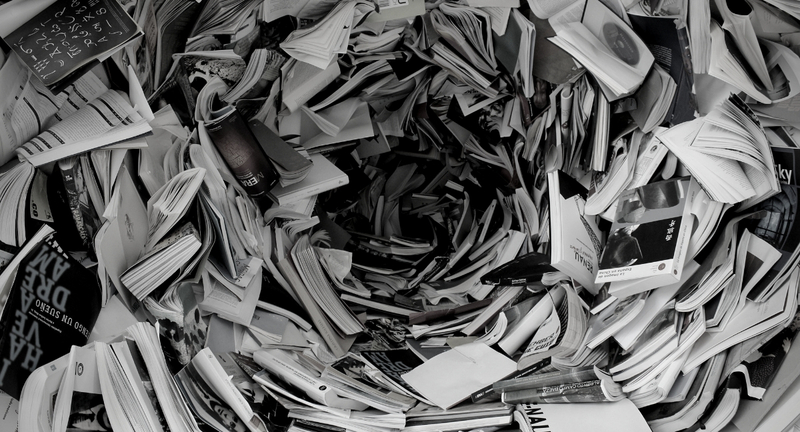 In addition to preventing your own paper pit, find out five more reasons why you should go paperless. Then schedule a quick 30-minute demo to ensure that your company doesn’t share Papier’s fate. What a good lesson. I enjoyed the article!